When you hear the name “El Pachuco” you automatically relate to low and slow, but not with Enrique and Elma Garcia’s ’69 Chevy Caprice. This luxury classic was completely gone through and the project has never stopped even after being featured in the March ’07 issue of Lowrider Magazine. 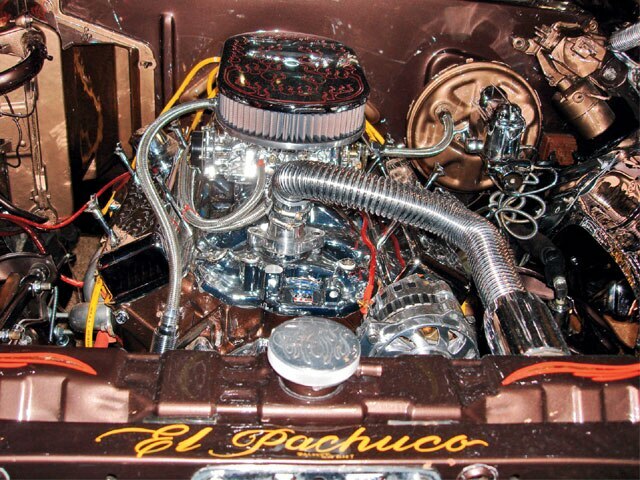 Enrique had the original small-block 350 engine brought back to life by Jose “Tavo” Peres at Tavo’s Machine Shop in Fort Worth, Texas. The engine was punched out .040 over and a mild cam was used to give the heavy “land boat” that sports car feel. The engine was hooked up with several bolt-on chrome aftermarket parts. Hedman “hedders” were used to allow the engine to breathe and an Edelbrock Permastar intake was used. This car’s owners never seems to stop and they’ve been improving on their vehicle in stages. We can’t wait to see what other tricks they add to their ride as Enrique told us that he has more plans in store for his luxury cruiser. If you feel that you have an engine worthy of our From The Hood section feel free to contact us at saul.vargas@primedia.com. A Billet Specialties Tru Trac serpentine setup without an A/C compressor keeps the engine running.An Optima battery powers up the system. 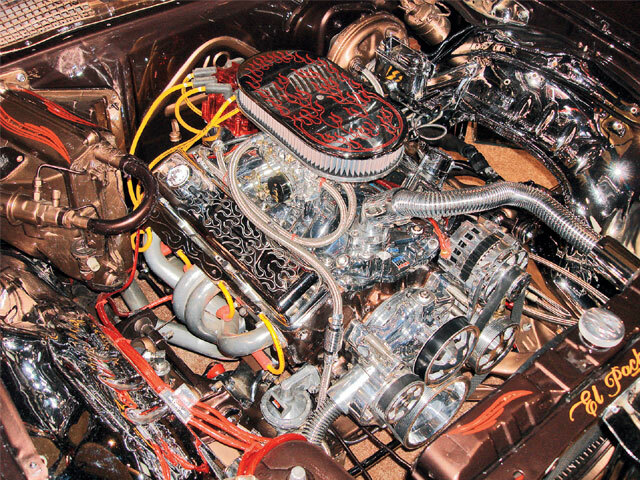 A custom see-through distributor sends spark through the Accel silicone sparkplug wires.Caption03Chrome and paint were used throughout the engine compartment to tie into the exterior of the vehicle. Cool-Flex hoses and steel-braided lines further highlight the compartment. 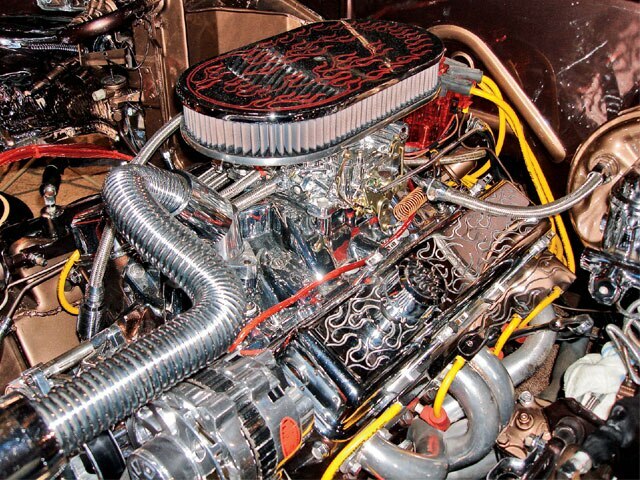 A chrome flame air cleaner and valve covers dress up the Edelbrock carburetor/intake combination. To feed the carsb, a Holley race pump was used.